1991: 100-70-83 = 253 points. 18/05/1991: 94-85-98 = 277 points. 14/03/1992: 96-93-92 = 271 points. 31/03/1992: 97-80-95 = 272 points. Overall Build: Powerful; thick fur; good colour and correct size markings; correct skull, sufficient underjaw; eyes medium-brown; slight neck skin; sufficiently firm back; very good croup; good angulations; strong bones; inharmonious gaiting, sufficient firmness in back and ligaments in motion. Nature: Calm, clear, sure, and impartial. High protective instinct and very high fighting spirit, very high courage and high hardness with middle sharpness. Note: Suitable to improve character. Gero von der Weyermühle passed the Körung 'for life' with highest rating for working drives and courage. At his ZTP he earned a V rating for both conformation and working drives. The judge also commented during the critique it was of great pleasure to witness such an exceptional character. Gero lived to 11½ years of age, DNA tested clear for vWD (VetGen), heart and eye problems. Gero's dam and sire both passed the Körung 'for life' while his dam Anouk von der Weyermühle competed twice in the D.V. Meisterschaft. Gero's sister, Gina, passed the Körung 'for life' with highest rating for hardness and working drives and is dam of the von der Weyermühle “I, K, M, N, P” litters (Ilo, Ira, Kleo, Kent, Mannix, Ningicosan, Pacco). Liv: SchH 1 and passed her ZTP with 1A rating for character and SG for conformation. Condor: SchH 3, FH, WDC-WM participant, IDC-WM participant and Danish Working Champion. 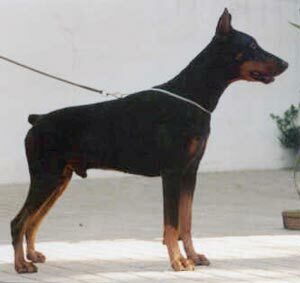 Igor: SchH 3, IDC-WM participant and sire of the vom Tschirgantblick “M, N” litters (Mylady, Nada). Earl: SchH 3 and DV-DM participant (placed 10th in 1998). Big Red One: SchH 3, DV-DM participant, FCI-WM participant and passed his ZTP with 1A rating for character and SG for conformation.